How much water does US fracking really use? Energy companies used nearly 250 billion gallons of water to extract unconventional shale gas and oil from hydraulically fractured wells in the United States between 2005 and 2014, a new Duke University study finds. During the same period, the fracked wells generated about 210 billion gallons of wastewater. Large though those numbers seem, the study calculates that the water used in fracking makes up less than 1 percent of total industrial water use nationwide. While fracking an unconventional shale gas or oil well takes much more water than drilling a conventional oil or gas well, the study finds that compared to other energy extraction methods, fracking is less water-intensive in the long run. Underground coal and uranium mining, and oil recovery enhancement extraction use between two-and-a-half to 13 times more water per unit of energy produced. The study also found that fracked oil wells generate about half of a barrel of wastewater for each barrel of oil, while conventional oil wells on land generate more than three barrels of wastewater for each barrel of oil. "Water use and wastewater production are two of the chief environmental concerns voiced about hydraulic fracturing," said Avner Vengosh, professor of geochemistry and water quality at Duke's Nicholas School of the Environment. "Yet until now we've had only a fragmented and incomplete understanding of how much water is actually being used, and how much wastewater is being produced." Added Vengosh: "Our new study, which integrates data from multiple government and industry sources, provides the first comprehensive assessment of fracking's total water footprint, both nationally and for each of the 10 major U.S. shale gas or tight oil basins." Vengosh and Ph.D. student Andrew Kondash published their peer-reviewed findings today (Sept. 15) in the journal Environmental Science & Technology Letters. "While hydraulic fracturing consumes only a small fraction of the water used in other extraction methods, our analysis highlights the fact that it can still pose serious risks to local water supplies, especially in drought-prone regions such as the Barnett formation in Texas, where exploration and development is rapidly intensifying," Kondash said. "Drilling a single well can require between 3 to 6 million gallons of water, and thousands of wells are fracked each year. Local water shortages could limit future production." Finding ways to treat and dispose of or recycle the large volume of chemical-laden flowback water and brine-laden wastewater that is produced over the lifetime of an unconventional oil or gas well also poses challenges, the researchers noted. "Given the high levels of contaminants these waters contain, it's startling that the amount of wastewater being produced from hydraulic fracturing in the United States is nearly on the same level as the amount of water used to frack the wells in the first place," Vengosh said. "Yet the quality of the water that comes out is very much different from the water the goes in." Because no single, reliable source of data currently tracks water use and wastewater production from unconventional shale gas and oil operations in all 10 major U.S. basins, Kondash and Vengosh culled data for their analysis from multiple sources, including the U.S. Energy Information Administration, state agencies, industry reports, the FracFocus Chemical Disclosure Registry and DrillingInfo.com. Although the new paper looks only at U.S. data, its methodology and findings could be used to project future water use and wastewater volume from hydraulic fracturing in other energy basins worldwide. I guess groundwater and aquifer contamination are not worth discussing? I find it odd that the fact that the combustion of natural gas and those byproducts from fracking is not enough for environmental concern. 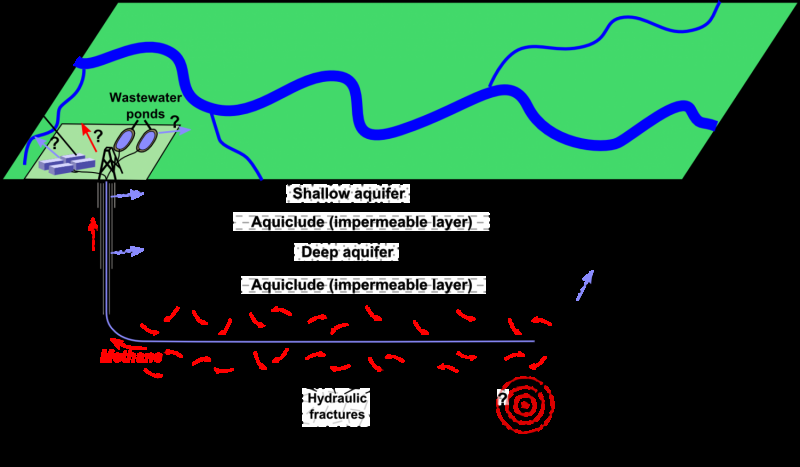 The disclosed ground water utilization and generation of virtually irreversibly contaminated waste water proves the sheer mega greed driven folly of increasing the current global oil glut by depleting a scare irreplaceable resource thereby creating a double whammy: localized ground water depletion and pollution of adjacent aquifers. And EPA and regulatory agencies are doing nothing to prevent the imminent creation of another 1930's dust bowl of vast uninhabitable land areas. Human greed driven folly is truly boundless! Since the injection of wastewater rather than the fracking itself is what triggers the associated earthquakes, why are the companies not obliged to filter the wastewater and return it to local water courses and aquifers. Even better, they could then reuse the water! I pay my local council for wastewater treatment from my home. Why are fracking companies not legally required to treat the wastewater as a condition of their licenses? If their answer is that the cost of extracting the oil or gas would be too high, then that would surely be the true cost in an equitably structured capitalist economy (which I support).